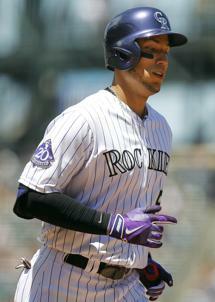 Colorado Rockies outfielder Carlos Gonzalez has been placed on the disabled list with a finger sprain. Gonzalez has suffered with the sprain on his right middle finger off and on for the past month. He will be eligible to return on August 20, although the Rockies are not in contention and there is no need to hurry him back until he is 100% healed. “I don’t want to go on the DL. But I can’t swing. I am just a slap hitter, that’s all I can do right now,” said Gonzalez after the Rockies’ 5-1 loss to the Pirates. Gonzalez is hitting .306 with 26 home runs and leads the National League in both slugging percentage (.591) and OPS (.958) and has 7o RBI.